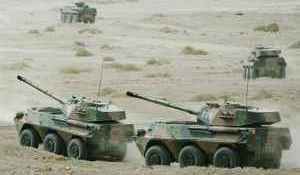 The PTL02 wheeled assault gun system was based on the ZSL92 wheeled armoured vehicle, integrated with matured weapon technologies including the Type 86 100mm towed anti-tank gun and the Type 88 main battle tank (MBT). The vehicle was designed to engage armoured vehicles, bunkers, fortifications, and other stationary or moved targets. 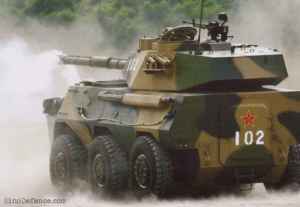 The gun system has been fielded along with the ZSL92 infantry fighting vehicle (IFV) and ZSL92A armoured personnel carrier (APC) in the PLA ‘rapid reaction’ wheeled mechanised infantry troops. 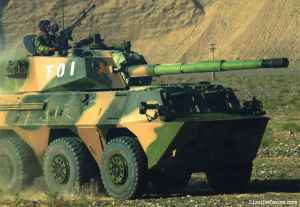 In the mid-1980s, NORINCO experimentally married its WZ551 wheeled armoured vehicle with the 100mm smoothbore gun of the Type 86 towed antitank gun to produce a high-mobility, cost effective self-propelled artillery system that can be deployed along with other wheeled armoured combat vehicles in development. 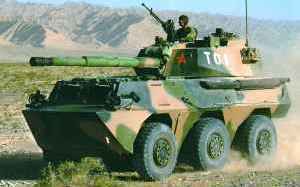 The resulted Type 87 assault gun was fielded by the PLA in a limited number. 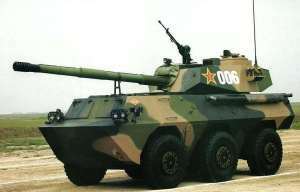 Based on its experience, a modified variant known as PTL02 (also known as Type 02) was introduced in 2002/03. The batch production of the system possibly began in 2004/05. The Type 87 and the subsequent PTL02 were both based on existing technologies, thus maximally reducing the development costs and simplifying the logistic supply in the operational units. The chassis of the gun system is almost identical to the ZSL92 armoured vehicle, with most of their parts exchangeable. The 100mm smoothbore gun fires the armour-piercing fin-stabilised discarding sabot (APFSDS) round with tungsten core, which is also used by the Type 86 anti-tank gun. 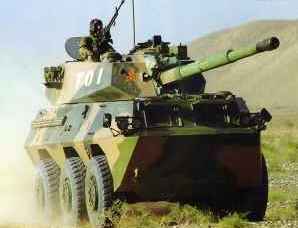 The fire-control and observation systems of its three-man turret was developed from those of the Type 88 MBT. 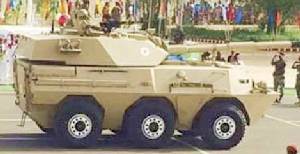 Compared to the conventional full-tracked fighting vehicles, the wheedled chassis of the PTL02 enables it to be deployed rapidly via motorway/road networks. With a combat weight of 19 tonnes, it can also be fitted into a medium-size transport aircraft. A Y-8 may carry two of such vehicles and an IL-76MD may carry three. The 100mm smoothbore antitank gun is designed to engage lightly armoured vehicles and fortifications, but is unable to destroy a heavily armed MBTs. The PTL02 can be found in the artillery regiment organic to a mechanised infantry division. Each artillery regiment has a subordinated anti-tank battalion, which deploys 18 assault guns. The PTL02 is carried on a 6X6 wheeled chassis, with the driver compartment in front, powerpack in middle, and turret/combat compartment at rear. The assault gun system has a crew of five. Armour protection against 12.7mm calibre weapon systems is provided all round. The crew members are protected by a collective NBC protection system and an automatic fire suppressing system. The gun system is powered by a German-designed BF8L413F 4-stroke, 8-cylinder, turbo-charged, air-cooled diesel engine with a standard power of 235kW (320hp) at 2,500r/min. The vehicle uses a mechanical gear box, with 9 forward and 1 reverse gears. Power assisted steering, independent suspension, and central inflating system are fitted as standard. However, the PTL02 lacks the two rear propellers found on the ZSL92, which suggests that the gun system is not amphibious. 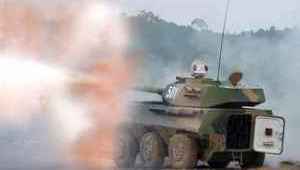 The main weapon is a 100mm high-pressure, low-recoil smoothbore gun developed from the Type 86 towed 100mm antitank gun, which can fire armour piercing fin stabilised discarding sabot (APFSDS) with tungsten core, as well as HEAT and HE rounds. The vehicle carries 30 rounds. Fire accuracy is attained by a primitive FCS light spot fire control system with IR night vision and laser rangefinder input. Auxiliary weapons include one 12.7mm/50-calibre anti-aircraft machinegun mounted on the command cupola, with a maximum fire-range of 2,000m and 480 rounds, and a 7.62mm co-axial machinegun with 800 rounds. A four-barrel smoke grenade launcher is mounted on each side of the turret.